Adam Harrison’s work is concerned with notions of visibility and invisibility in relation to the nature of art and photography, and of seeing as a visual phenomenon. His practice acts as a self-reflexive examination of how artworks might prompt a deeper consideration of art through an attempt to understand its fundamental aspects. ‘Making Work’, his upcoming exhibition at Dyan Marie Projects, features a group of photographs that that depict the creation of various forms of art, including painting, drawing, sculpture and photography. 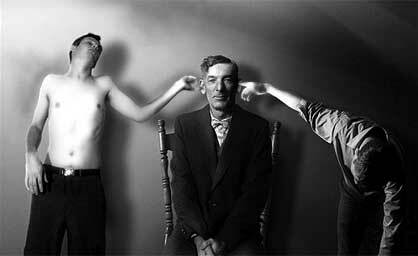 Harrison is a Vancouver-based artist-photographer. He began his career under the mentorship of Jeff Wall, and is part of a tradition in Vancouver photography that approaches picture-making with an intellectually rigorous, self-reflexive understanding of the medium. 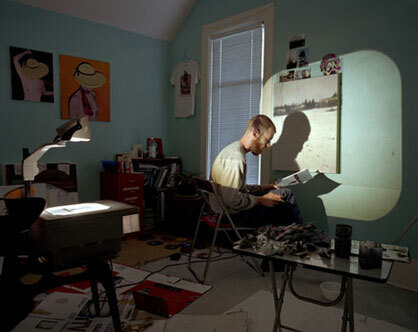 Recent exhibitions of Harrison’s work include the Belkin Satellite, Vancouver, Helen Pitt Gallery, Vancouver, Lee Ka-Sing Gallery, Toronto, and the Cooley Gallery, Reed College, Portland, OR. His work has been featured or reviewed in Lapiz Magazine, Toro Magazine, Ripe Magazine, NOW Magazine and Geist Magazine and was included in Carte Blanche, an anthology of Canadian photography published Magenta Foundation. In addition to his photographic practice, he is co-editor of Doppelganger Magazine, co-curator of CSA Space, and an active art critic. His writing on art has been published by Canadian Art, Fillip and Terminal City, as well as in various other publications, catalogues and artist monographs. RCVA Lecture Hall, 2nd Fl. In the “D”, “D” doesn’t really stand for “Detroit”, but “Demolition.” Take a look around and you’ll notice a great number of buildings marked on the front with a circled “D” in faint chalk. Off to the side, many of these same buildings will also have a noticeable dot, courtesy of our own native son, Tyree Guyton. These dotted buildings have stood for so long that they have become, arguably, the most memorable landmarks of our fair city. In addition to Tyree Guyton, Detroit has had more than its fair share of artists who have taken notice of this situation and done something about it. Recently, however, we have taken up a particular project that has actually netted results – faster than anyone, especially us, could have anticipated. The artistic move is simple, cover the front in Tiggeriffic Orange – a color from the Mickey Mouse series, easily purchased from Home Depot. Every board, every door, every window, is caked in Tiggeriffic Orange. We paint the facades of abandoned houses whose most striking feature are their derelict appearance. A simple drive would show you some of our most visible targets. Just off I-75, around the Caniff/ Holbrook exit, on the west side, towers a three story house, saturated so deeply in orange that it reflects color onto the highway with the morning sun. Also, on the east side of the highway by the McNichols exit, is another house screaming orange. In that same area, where the Davison Highway and John C Lodge M-10 Highway intersect, sit a series of two houses painted orange, most visible from the Lodge side. In our only location not visible from the highway, on the Warren detour between 94 and 96 on Hancock Street, sat a house so perfectly set in its color that it garnered approval from the Detroit Police Department. Two of four locations have already been demolished. Of the four, the building on Dequindre, by the Caniff/ Holbrook exit, remains, as does the site that intersects the Lodge and Davison. There was no “D” on any of the façades, only burnt boards, broken glass, and peeling paint. Rallying around these elements of decay, we seek to accentuate something that has wrongfully become part of the everyday landscape. So the destruction of two of these four houses raises a number of interesting points. From one perspective, our actions have created a direct cause and effect relationship with the city. 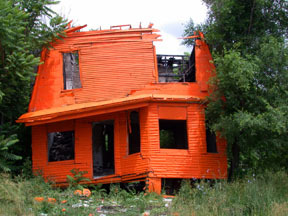 As in, if we paint a house orange, the city will demolish it. In this relationship, where do the city’s motivations lie? Do they want to stop drawing attention to these houses? Are the workers simply confused and think this is the city’s new mark for demolition? Or is this a genuine response to beautify the city? From another perspective, we have coincidently chosen buildings that were set to be demolished within the month. However, with so many circled “D”s on buildings, it seems near impossible that chance would strike twice. In any case, what will be the social ramifications of these actions? Each of these houses serves within the greater visual and social landscape of the city. 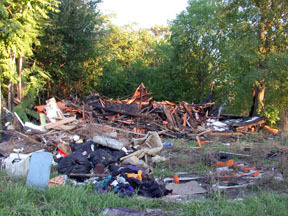 If the city doesn’t rebuild, will it be better to have nothing there rather than an abandoned house? In addition, each of these houses served as a shelter for the homeless at some point in time. Now there are, at least, two less houses for them. Why didn’t the city simply choose to renovate? Everything affects not only our experience now, but also that of the next generation. So before they are all gone, look for these houses. Look at ALL the houses in Detroit. If you stumble upon one of these houses colored with Tiggeriffic Orange, stop and really look. In addition to being highlights within a context of depression, every detail is accentuated through the unification of color. Broken windows become jagged lines. Peeling paint becomes texture. These are artworks in themselves. The Heidelberg Project began as an outdoor art environment in the heart of Detroit, but it has grown into much more. Today the project is recognized around the world as a demonstration of the power of creativity to transform all those whose lives it touches. The Heidelberg Project offers a forum for ideas, a seed of hope, and a bright vision for the future. 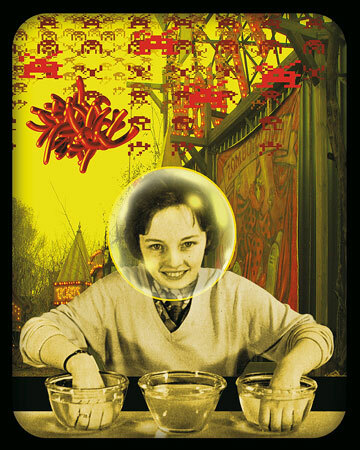 Image Credit: Christopher Dean, Your Crushing Defeat 2006, lenticular giclée print, 81.3 x 101.6 cm, Photograph courtesy of the artist. Opening reception: Friday March 23 7:00 P.M. The Art Gallery of Windsor pumps up the volume with a cross-over hit: an exhibition of 22 artists from the Windsor/ Detroit area. In the place best known for fast cars and dance music, we considered over 140 artists from both sides of the Detroit River who wanted in. The question remains: is this an international or a regional show? With globalization, contemporary art has become more international. Increasingly, artists from diverse cultures and geographies are participating in the universal language of visual _expression_, often using new media to create their work. At the same time, artists are moving around more than ever. Many have been born in one country, and educated in another; others live in Canada and work state side. Alana Bartol, Windsor; Douglas Bedard, Windsor; Matthew Blake, Detroit; Sara Blakeman, Detroit; Steven Matthew Brown, Detroit; Mira L. Burack, Bloomfield Hills; Jack Byng, Windsor; Christopher Dean Ferndale, Angela Desjardins, Windsor; Janet Hamrick, Ferndale, Chido Johnson, Detroit, AndrewandAndrea (Andrew Lochhead and Andrea Slavik), Windsor; Cyndra MacDowall, Windsor; Melanie Manos, Ann Arbor; Dennis Michael Jones, Ann Arbor; Toby Millman, Ann Arbor; Zeke Moores, Windsor; Troy Ouellette, Windsor; Margaret Parker, Ann Arbor, Nancy Patek, Gross Pointe Woods; Mike Richison, Oak Park, and Mark Schwing, Detroit.